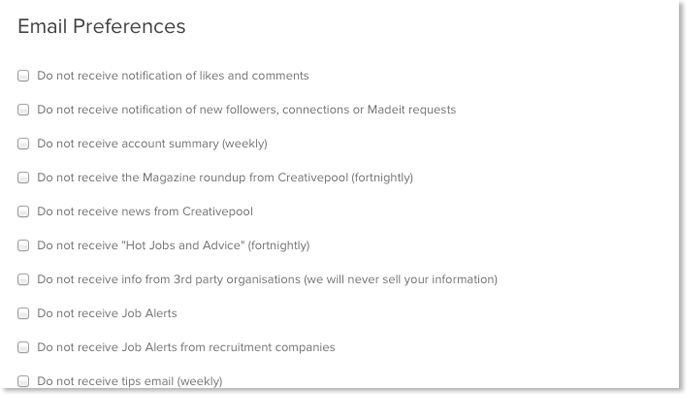 What subscriptions am I signing up to by agreeing to create a profile on Creativepool and confirming my email address? I don't have a login and want to stop receiving emails. Help! I'm not looking for a job right now. How can I show this on my profile? Can I hide my profile from search engines like Google? How do I stop people from being able to contact me through Creativepool? Who can find my CV? By confirming your email address and creating a profile on Creativepool, you are agreeing to receive a number of emails from us which allow us to provide our services to you. If you are receiving emails that you don't want you can easily remove yourself from these email types. Here you can tick or un-tick the emails you'd like to receive. If you do not have a login for Creativepool and would like to stop receiving emails from us, there should be an "unsubscribe" option at the bottom of every communication we send out. Not all of our members use Creativepool to find jobs. If this is the case for you, you can show yourself as unavailable. Once your profile is set to unavailable it will look like this. If you don't want your profile to be visible to search engines you can change your visibility settings. Fancy yourself as a Banksy and want to keep things anonymous? You can choose to hide your full name so that anyone that finds your profile will be unaware that it's you. You can both hide your contact details and prevent people from contacting through the site. The settings to stop people from contacting you are the same as the settings for who can see your contact details. When you upload a CV it can be downloaded by 'Anyone' however this means that companies that have purchased CV Search are able to download. You can quickly and easily change this setting in your Privacy preferences. If you select Nobody, recruiting companies will no longer be able to download your CV.